I'm a milk lover. Always have been. I use milk in my cereal. I add milk to my Apple Dumplings. When I am thirsty, nothing quite quenches my thirst like milk. I use creamers for my coffee (when I first started drinking it, with as much milk as I used, it was almost like the coffee really was only there to warm the milk!). I recently was asked about taking the Silk for Milk 10-Day Challenge. The Challenge - substitute Silk for times when you would normally use Milk for 10 days. Looking for ideas on how to make substitutions, you can find some here. We decided to give it a go at my house. We tried substituting Silk where we would normally use milk (or cream). Since we first tried Silk, we have used the various varieties on our cereal, in our coffee, as a drink at dinner, warmed as Hot Chocolate, as part of the mix for French Toast and in a Smoothie. And, we liked it! We like the Dark Chocolate PureAlmond, but when we were drinking it straight up, we had to cut it with milk as it was almost too rich, especially when warmed. On cereal, or in coffee, it was okay because the cereal or coffee would cut the richness. We haven't yet tried the regular Coconut Milk. Since we had tried both the regular PureAlmond and the Vanilla PureAlmond, and preferred the vanilla we started with the Vanilla Coconut Milk. We enjoyed it so much that the next time we purchased it, we selected it again, opting not to try the regular. For a quick and tasty smoothie, we simply combined frozen pineapple chunks and the Vanilla Coconut Milk. I found that adding the Vanilla Coconut Milk to my coffee was very delicious, especially when I was drinking French Vanilla coffee. We really enjoyed both the Vanilla PureAlmond and the the Vanilla Coconut Milk as a substitute on our cereals - it gives a nice depth of flavor to Rice Chex, Corn Flakes and Chocolate Cheerios! Interested in trying the Challenge? You can get a 75₵ coupon to help you get started. One A Busy Mom of Two reader will win a coupon for one Free Silk Milk for themselves, as well as a Silk branded Chicobag. To enter, leave a comment telling me how you would substitute Silk for Milk in your daily routine. 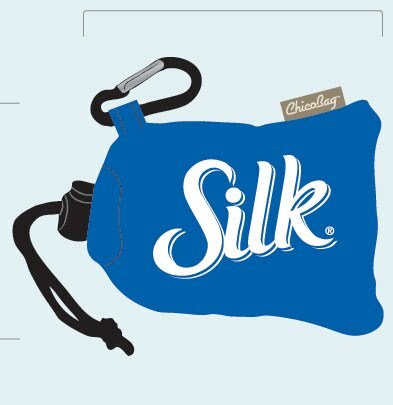 Follow Silk and A Busy Mom of Two on Twitter and tweet about this giveaway. This can be once daily, please be sure to leave a link to the tweet in your comment. Add my button to your sidebar or my blog to blog roll. Leave a link letting me know where you added it. Giveaway will remain open until May 12th at 6pm and is open to US residents. Winner will be selected using Random.org random number generator. The winner will be contacted by e-mail (Please make sure that your email address is either in your comment or clearly visible on your profile or blog) and will have 48 hours to respond or a new winner may be selected. No compensation was received for this post. I received a coupon to try Silk Milk for free. All opinions expressed are completely my own. In addition, I have been participating in a BzzCampaign. I'd like to make Rice Pudding with it. You are on my blogroll at the very top! I like to drink a glass of milk with dinner. I'd substitute that with Silk, and I'd also love to try it in my coffee. Thanks! We already substitute nondairy milk in most things we cook because of food allergies. I could use half milk and half silk in anything that needs milk! I would substitute in my smoothies. I would use Silk instead of milk on my cereal. I would like to try it over cereal in the morning. I love making oatmeal with Silk. So rich and creamy! I'd like to try it in smoothies. I have it as an afternoon snack. The vanilla is yummy. Our store doesn't sell the coconut but would LOVE to try that.